Current interaction with machine learning systems are mostly batch-based. A system takes a set of annotated data as input, and returns a trained model. 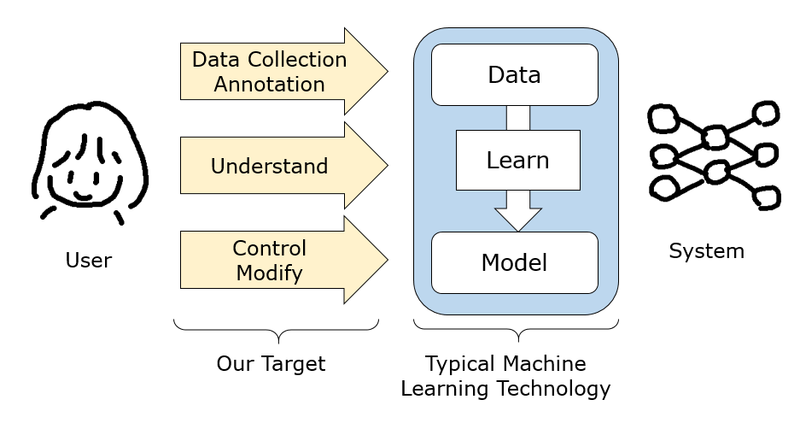 This model is problematic because the annotation process is labor intensive and the training process works as a black box, making it difficult to understand and control. This project addresses this problem by incorporating rich visual interaction into machine learning. The user and the system interactively work together in data annotation, model learning, and using the result in applications. Here is some example topics we plan to work on in this project. - Clarifiying the expectations and requests of practitioners who want to use machine learning. - (Semi) automation of tasks currently done by professional data analysits. - Development of machine learning tools for practitioners without expertise in machine learning. - Interactive visualization techniques for data annotation and machine training. - Human-machine cooperative learning methods (in crowd sourcing). - Interacive control user interfaces for generative methods in machine learning.